Surveys the main debates surrounding the concept of dramatic character and – contrary to recent trends – explains why transformative actors conceive their characters as ‘independent’ of their own personalities. Describes some important techniques used by actors to construct their characters by physical means: work on objects, neutral and character masks, Laban movement analysis, Viewpoints, etc. 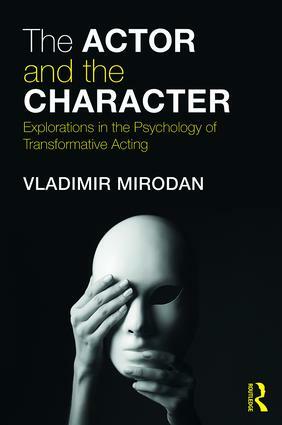 Examines the psychology behind transformative acting from the perspectives of both psychoanalysis and scientific psychology and, based on recent developments in psychology, asks whether transformation is not just acting folklore but may actually entail temporary changes to the brain structures of the actors. The Actor and the Character speaks not only to academics and students studying actor training and acting theory, but contributes to current lively academic debates around character. This is a compelling and original exploration of the limits of acting theory and practice, psychology, and creative work, in which Mirodan boldly re-examines some of the fundamental assumptions of actor training and some basic tenets of theatre practice to ask: What happens when one of us ‘becomes somebody else’? Vladimir Mirodan is a theatre director, Emeritus Professor of Theatre, and was Vice-Principal and Director of Drama at the Royal Conservatoire of Scotland and Principal of Drama Centre London. He has published on topics of acting psychology, as well as the theory and practice of acting.